Almost three years after Britons voted to walk away from the EU, the bloc’s leaders seized control of the Brexit timetable from May. That averted a chaotic departure on March 29 that would have been disruptive for both the world’s biggest trading bloc and for Britain. A key figure in the Democratic Unionist Party has suggested the Northern Ireland party is still opposed to Prime Minister Theresa May’s Brexit withdrawal deal. The DUP is important because its votes prop up May’s minority government. The prime minister needs to convince its 10 legislators to back the bill if she is to have any hope of winning Parliament’s approval. The bill has already been defeated twice by substantial margins. Dodds says May “missed an opportunity” at the EU summit in Brussels on Thursday to put forward proposals that could have made the deal more attractive. Virgin Group founder Richard Branson says Britain is “dangerously close” to the “full-scale disaster” of leaving the European Union without an agreement. In a blog post released Friday, Branson argues that Britain is facing a national crisis because Prime Minister Theresa May is “no longer acting in the national interest” and has limited lawmakers to a choice between the agreement she negotiated and a so-called ‘no-deal’. Virgin’s businesses range from airlines to financial services and media. French President Emmanuel Macron says Brexit is more a “political lesson” than a lengthy technical negotiation. Macron added in case of a no-deal Brexit, the first victims would be Britain’s less well-off. Varadkar says EU nations that lie farther from the U.K. “are kind of sick of this” and were reluctant to prolong the Brexit process any further. European Council President Donald Tusk is happy about the outcome of the Brexit summit but says there’s nothing more the EU can do to help Prime Minister Theresa May. Wholesale florists at London’s new Covent Garden Market say the delay to Britain’s planned March 29 departure from the European Union is adding to business uncertainty. The prime minister of non-EU member Norway says there is “still an imminent danger” of Britain crashing out of the bloc without a deal. Late Thursday, EU leaders rejected British Prime Minister Theresa May’s request to extend the Brexit deadline from March 29 — just one week away — until June 30. Instead, they agreed to delay only until May 22, on the eve of EU elections, if May can persuade Britain’s Parliament to endorse the Brexit deal. Failing that, Parliament would have until April 12 to choose a new path. Germany’s main business lobby group is calling on Britain to put a swift end to the “excruciating uncertainty” companies face and resolve its Brexit impasse. European Union leaders have agreed to give London a bit more time to try and pass a twice-rejected divorce deal or choose a new path, but the agreement doesn’t make any clearer what will ultimately happen. Benn says it is time to “open up this process” because Parliament has already rejected the prime minister’s deal and the option of leaving without a deal. 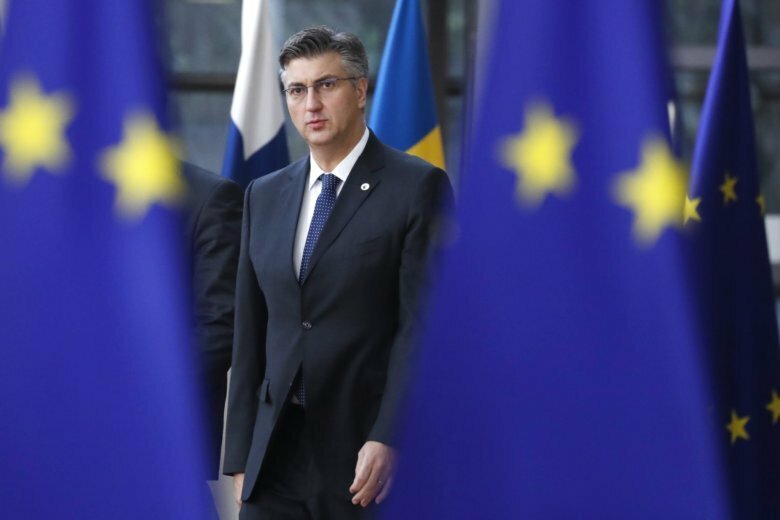 Croatia’s prime minister says European Union leaders are protecting their citizens and businesses by setting strict deadlines for Britain’s departure from the bloc given the impasse in the U.K.
European Union leaders are gathering again Friday after deciding that the political crisis in Britain over Brexit poses too great a threat to the world’s biggest trading bloc. At marathon late night talks, the leaders rejected May’s request to extend the Brexit deadline from March 29 — just one week away — until June 30. They agree to delay only until May 22, on the eve of EU elections, if she can persuade Britain’s Parliament to endorse the Brexit deal. Failing that, May would have until April 12 to choose a new path.